This is only an opinion that it could be or could not be the mom. I do recall one of the Netz FB pages stating they were from Delaware I believe...I will go and look. Yes, Phillips Myspace has his hometown as Delaware. Thank-you for looking up Phillips. I want to put the pieces of the puzzle together. Where is the baby Lisa? I hope family members offer the reward money soon while minds are still fresh. 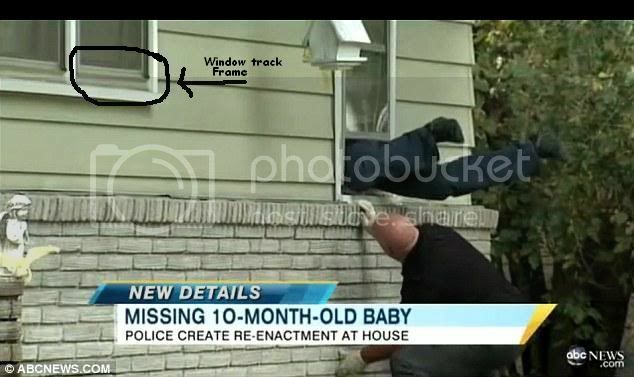 Police officer gets stuck in window during re-enactment of Baby Lisa kidnapping - casting new doubt on parents' story..
Memorial contributions in her name to the Sun East Federal Credit Union, c/o Margaret Chivalette Trust Fund, P. O. Box 2231, Aston, PA 19014 would be appreciated by the family. I see their was a trust fund set up in the late moms name for Margaret Chivalette. Jerseygirl345, a big thank you for keeping everyone so informed. I have to give you credit - nothing gets by you. Search boats along the Missouri River. It was not known if these boats were involved in the search for baby Lisa. This type of window is hard to maneuver from the outside.. I had this type of windows. The window track frame has 3 tracks. One for the upper window .. One for the lower window..
And one for the screen.. And they lock in place with a metal clip inside. It would of been a lot earlier to just cut the screen . Its hard to believe a break in from front window facing the street . 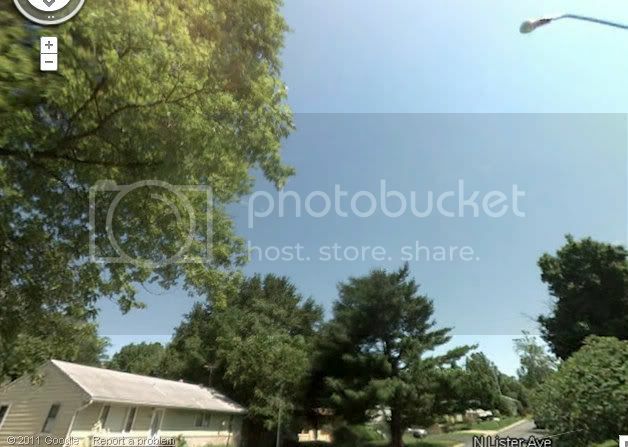 I notice a light next to the left side of the front door.. Was there a street light by the home also? I just wonder if this was a prior incident with the front window? LE should start checking any nearby businesses for video footage of the streets. Maybe they could track the vehicles of the family coming and going in the neighborhood. I wonder if Jeremy has ever questioned the paternity of Lisa? He did with his son. maps. Curious if you can walk to the river or is the area open that a cell phone ping, could be picked up? Thanks. KMBC's Peggy Breit: Jeremy's sister says she's heard of two instances where investigators have been checking reports of a family with a baby. One was a tip that a couple with a little boy was checking out at a store, but they were buying girls' clothes. 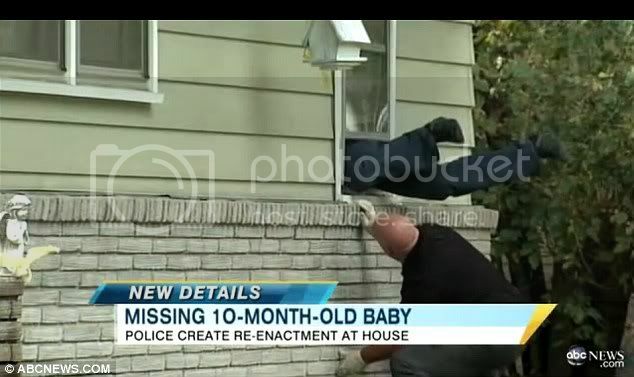 The other was a friend who said police came to her door and asked her to prove that her 10-month old daughter was really hers. Police will not comment on specific tips, but will say that they've checked out tips about babies, and nothing has panned out. A better and crisper map. 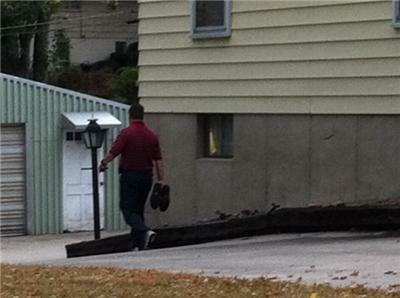 Another view of investigators searching the backyard. 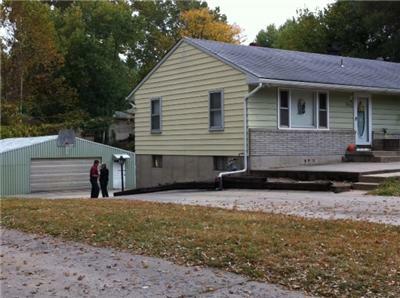 Police return to the Irwin home to search the backyard. KANSAS CITY, Mo. - Police have not released any information about a potential suspect in the disappearance of 10-month-old Lisa Irwin, but a neighbor says investigators have questioned him about a man who has been seen riding his bike in the neighborhood. The neighbor said authorities brought a picture of a man to his door and asked him if he had seen him. He told police that he had seen the man, who he described as in his 20s, riding a bike and carrying a backpack. The neighbor, who has lived in the neighborhood for 40 years and says he knows all of its residents, said he is sure the man does not live close by and was suspicious of the man even before Lisa disappeared. 1) It's amazing how quickly she is able to compose herself after she bursts into tears. 2) She looks at him often, while she is telling her story, like she is looking for reassurance from him. Why? I keep watching this tape over and over because I'm confused. At one point Deborah says that on that night she left the computer room window open. At another point she says that they almost never leaves the windows open, except their bedroom because it's high off the ground and not often she leaves the windows cracked in the boys room. When Jeremy comes home he asks her why is the screen popped out. Wouldn't he first ask why the window is open? I could be totally confused about this point. She also appears to contradict herself regarding security and safety. First, she says that they hardly ever leave the windows open at night. Then she said she doesn't remember if the front door was locked or unlocked? I know that in small towns people often leave their homes and cars unlocked. That being said, the front door uncertainty is feasible. However, if it is no biggie leaving it unlocked, why then make a big deal about the windows hardly ever being left open at night? She actually states that they feel comfortable leaving their bedroom window open since it's high off the ground. This would indicate that she has security concerns, but then she doesn't make sure the front door is locked? That doesn't make any sense. Very fishy that.